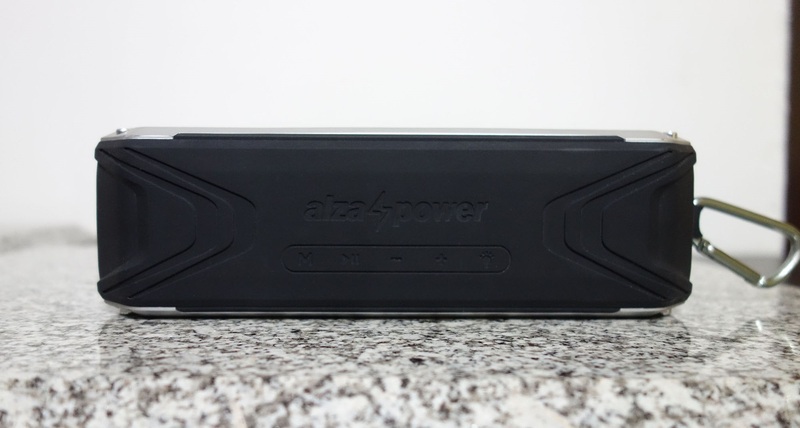 The AlzaPower Rage R2 is a great speaker at a reasonable price. It's affordable price versus performance is impressive. It plays well, looks good, lasts long without needing to connect to a charging cable and it's easy to carry. But let's look a little deeper into the details. We'll be sure to cover everything. What are some AlzaPower Rage R2's pros, cons and how well does it play? How Does the AlzaPower Rage R2 Play? I have to take a moment to talk about the frequency range of the AlzaPower Rage R2. If I take 1kHz as a reference, then I would be willing to give the speaker a frequency range from 200Hz (3dB3) and above. The indicated 90Hz plays with such extreme low attenuation to the rest of the spectrum, that the human ear has no chance in hearing it. The fact that the deep bass speaker does not play (as well as any of its other dimensions) doesn't mean that you will not hear the bass player or the drummer, but you will hear the higher harmonics tones of their instruments. 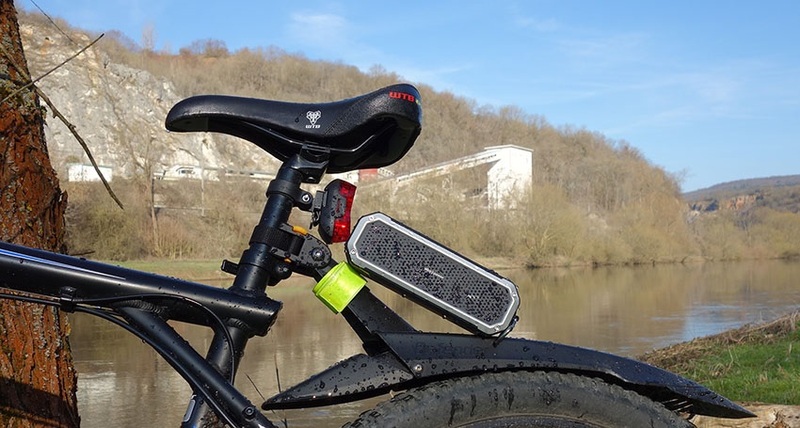 The speaker is easy to carry anywhere. The AlzaPower Rage R2 weighs only 400 grams, is comfortable to hold in your hand and can be hung on a backpack or any loop thanks to the carabiner. The speaker's front grille is made of made of aluminium, and the silver details are made of plastic. On each side of the speaker there is another function. On the left there is an LED flashlight, and on the right there is a carabiner. The black belt in the centre of the loudspeaker is rubber, which contributes to a very secure grip - the speaker will stay put in your hand. The AlzaPower Rage R2 has an IP rating of IP65, which is enough for trouble-free use on a sandy beach and listening outdoors in heavy rain. Throwing it under water would probably not be the best idea and I have never tested it. 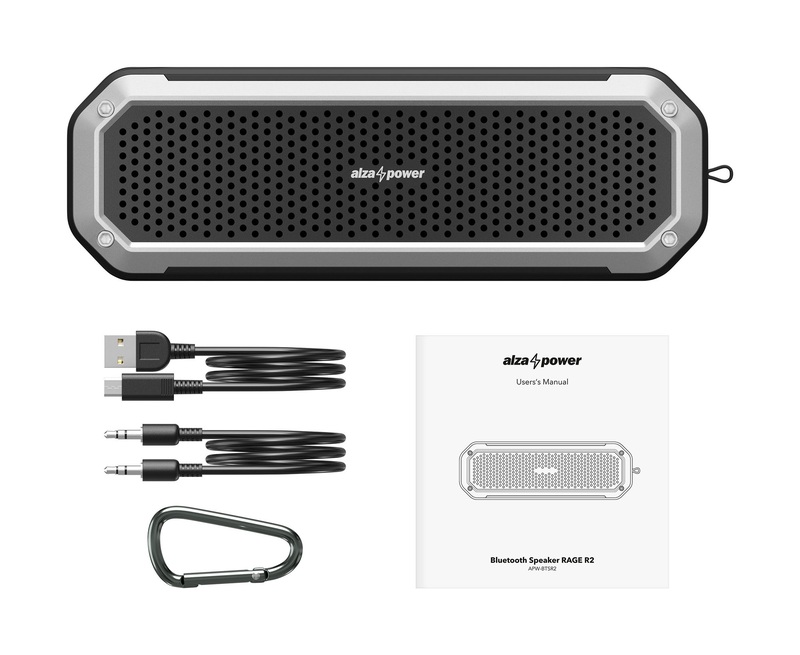 The AlzaPower Rage R2 includes a manual, 3.5mm <-> 3.5mm line cable, carabiner and USB charging cable <-> micro USB. You'll also be happy to hear that all of it is wrapped up in a box made of recycled paper. The AlzaPower Rage R2 buttons on top are a standard set of controls except for the M symbol on the far left, which turns the microphone on/off during a call. Which, by the way, I don't understand at all. Why would you turn off the microphone when you are making a phone call? When I tested out the call through the loudspeaker, it didn't score highly. I could understand the other person on the line, but she did not understand me clearly even though the room I was in was silent. Maybe it's just a faulty piece? Next to the microphone off button, you will find the play/pause button, followed by the volume +/- buttons and the button on the far right to turn the LED flashlight on and off. I have to make a comment about the volume buttons. If you hold them continuously, the volume changes. But when you press them twice in a row, you move the track forward/backwards. You just have to get used to it. Remove the rubber cap on the back is a little awkward in order to turn on/off the speaker. It would be much better if the controls were somewhere on the top. 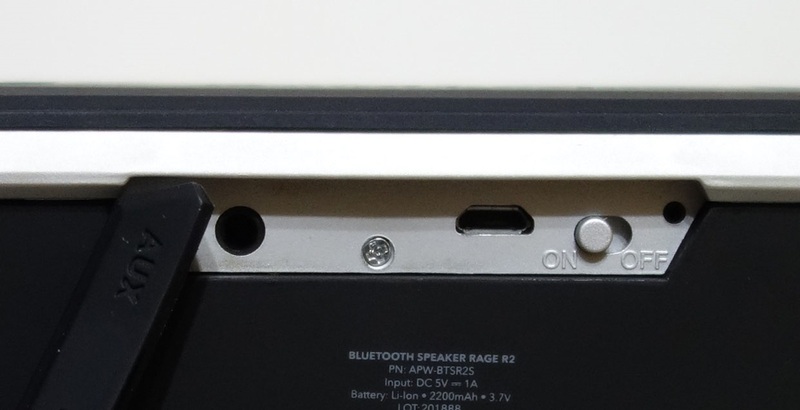 What I really don't like is that the AlzaPower Rage R2 has a hidden slider for turning the speaker on and off under a rubber cap on the back. Every Bluetooth speaker I ever had in my hand had a power button right next to pairing and volume. Charging the AlzaPower Rage R2 is via a micro USB cab . If you don't have a charger from your mobile phone or tablet, I can refer you to our e-shop, where you will find a lot of chargers for an affordable price. 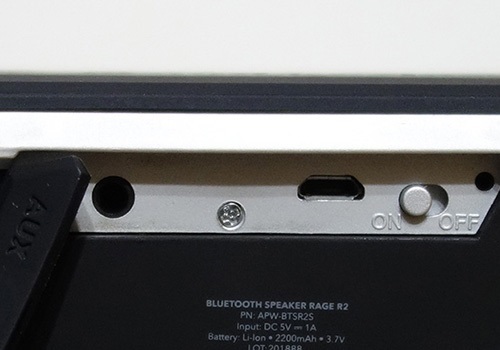 The AlzaPower Rage R2 includes a common Bluetooth chipset from Qualcomm. 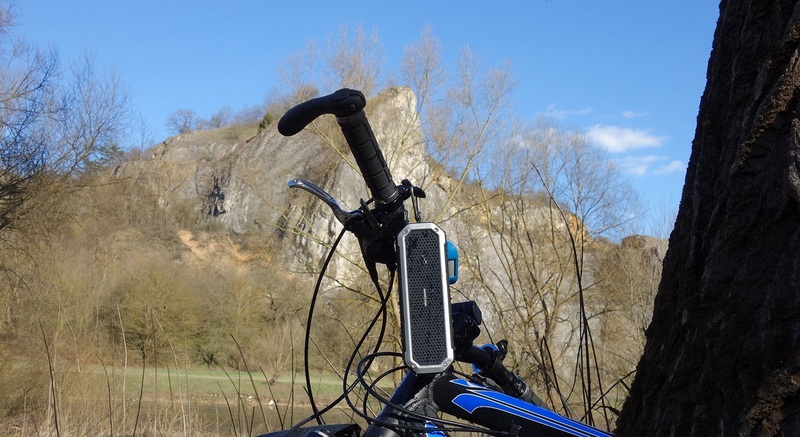 The chipset is very reliable and guarantees uninterrupted connection to your mobile and tablet, but it has no effect on the sound quality (the speaker only supports the SBC codec). The AlzaPower Rage R2 is available in green , blue , red and silver colours. The speaker doesn't have any high-end components, nor does it have great bass as read in the product description. For it's price range, it isn't just not possible. What the speaker does have and what is great is it's wireless range. The AlzaPower Rage R2 worked through two load-bearing walls and exceeds the 10m range in free space (it played up to 22 meters away from a mobile phone). iCSR was a chipset maker, which Qualcomm took over at the end of 2015. 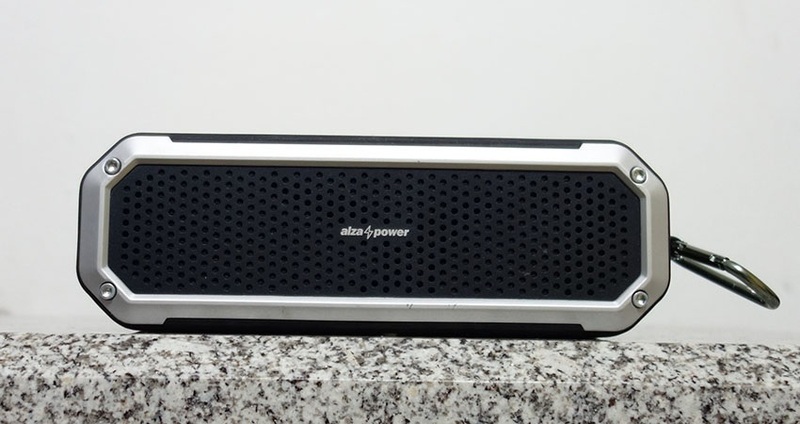 There are two 40mm stereo speakers on the sides and a passive radiator in the middle of the AlzaPower Rage R2. 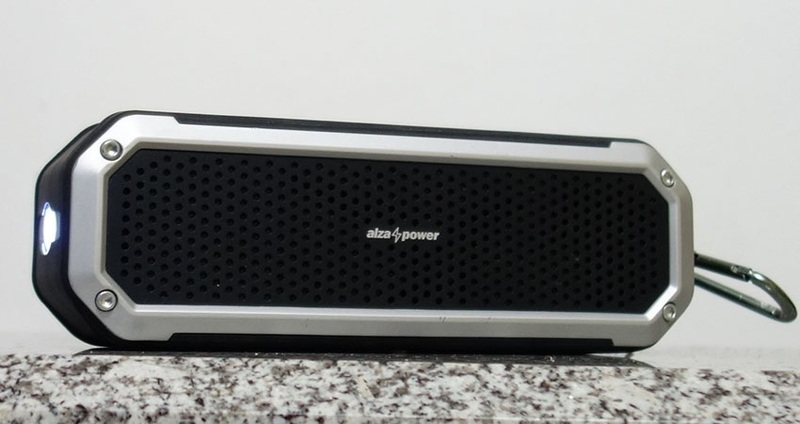 Although the name AlzaPower might seem that the speaker has a powerbank function, this is not the case. However, one big plus of the AlzaPower Rage R2 is that it lasts relatively long on a single charge. Up to 20 hours during quieter listening and approximately half as long when at a relatively loud volume. However, the battery charge indicator is missing. The speaker sounds a loud beep a few minutes before the built-in battery is fully discharged. AlzaPower Rage R2 will please both teenagers and athletes. The AlzaPower Rage R2 also has an auto-off feature. If you turn on the speaker, do not pair it, nor connect the line cord, it will actually turn off after a while. Similarly, it turns off when you turn off the Bluetooth adaptor on your mobile phone. However, when the speaker is paired or the line cord is plugged in, it remains on until the battery is completely discharged, regardless of whether it plays music or does nothing at all. As you might expect - there isn't bass under 200Hz. As soon as turned on the speaker for the first time, I remembered the sound of Bose SoundLink Micro, which I was excited about. 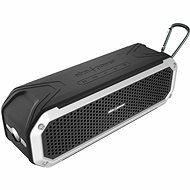 However, the Bose speaker is much smaller, more portable and more functional. But it should be emphasised that it costs more than 3 times as much as the AlzaPower Rage R2 speaker. My impression of the sound when first listening to the R2 was that it has excellent clarity. You will be thrilled when you play some lighter pop, acoustic guitar, folk, singing and the like. 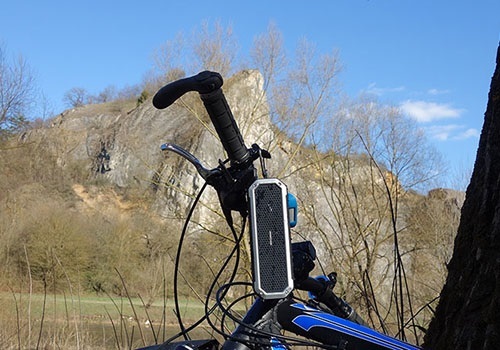 The extreme low-frequency attenuation means there is no rumbling sound that is usually a feature in low-cost portable speakers. 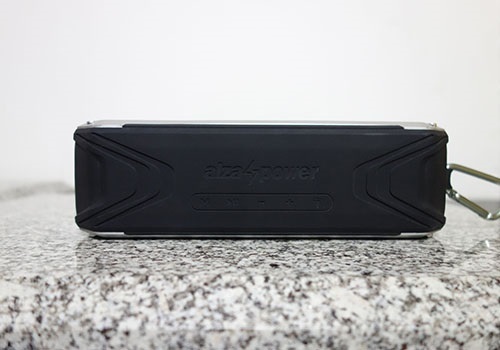 The AlzaPower Rage R2 Portable Speaker is rated IP65. 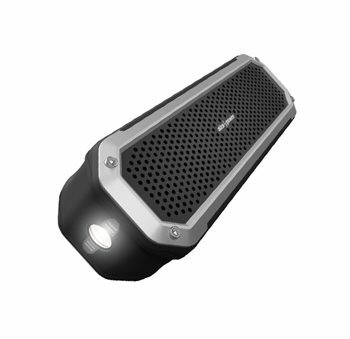 The AlzaPower Rage R2 is not a very suitable speaker for solo bass, metal or hip-hop. But it is not true for everyone. There are people who do not mind the great bass attenuation and prefer it because of the clarity. I can highly recommend Rage R2. 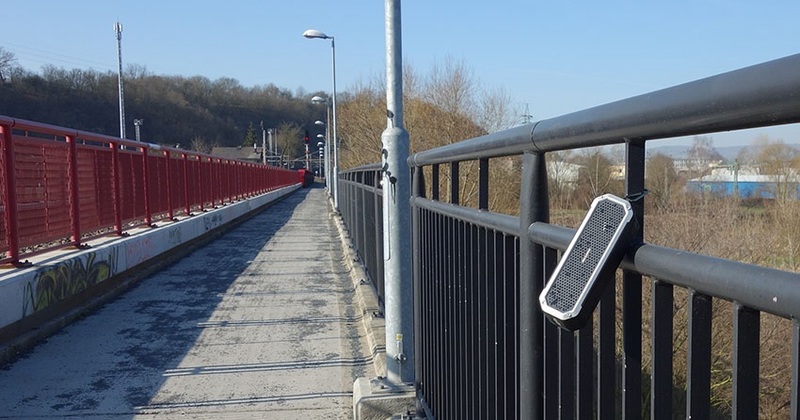 Another thing is that you can take this speaker to the skatepark without worrying that someone will step on it and break it. Evaluating extremely affordable and very expensive products is a difficult matter. For more affordable products, you cannot expect them to be error-free, but for expensive ones, it is difficult not to slide into mere glorification. If you ask me what kind of speaker you want to buy with a limited budget, the AlzaPower Rage R2 is without any doubt at the top of the list. The carabiner on the side of the AlzaPower Rage R2 is a superb feature. The AlzaPower Rage R2 is the king of the price vs. performance ratio, but it is not the absolute winner. 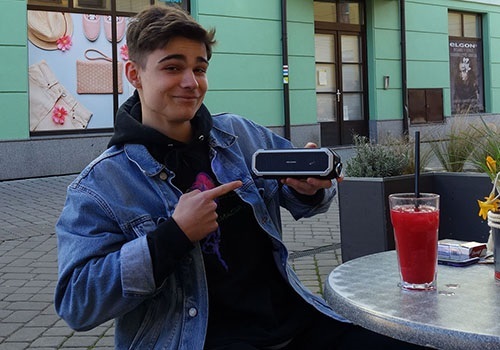 However, if the price does not matter to you, the Bose SoundLink Micro will offer you a higher quality of workmanship in a more compact size and a comparable sound performance, while the JBL Charge 3 adds extra power with its bass and powerbank feature. However, both speakers are in a completely different price range. The AlzaPower Rage R2 is a great buy if you want a speaker that can play loudly and won't empty out your wallet. If you buy it as the first speaker for your kids, they will surely be pleased. The favourable price is also an advantage because you won't have to worry too much about taking the speaker on the road, in school or while travelling. When you lose a speaker that's more affordable, it won't upset you as much. Although I hung up the guitar on the wall a few years ago, I stayed with the audience. Formerly, I was an amateur sound engineer, and now I sell used Hi-Fi speakers. I prefer speakers from the 1990s when you could still get quality pieces at a great price. Cutting, grinding, varnishing, and other hobbies are my source of livelihood. At the same time, I enjoy anything related to sound. At the Czech University of Life Sciences, I graduated with a degree in IT, and I could still probably manage router configurations and other computer HW/SW activities.